Do you want to make a difference to our shelter, our animals and our future? RSPCA Darwin is always in need of dedicated, passionate and skilled volunteers with the time to help us help the animals of the Territory. 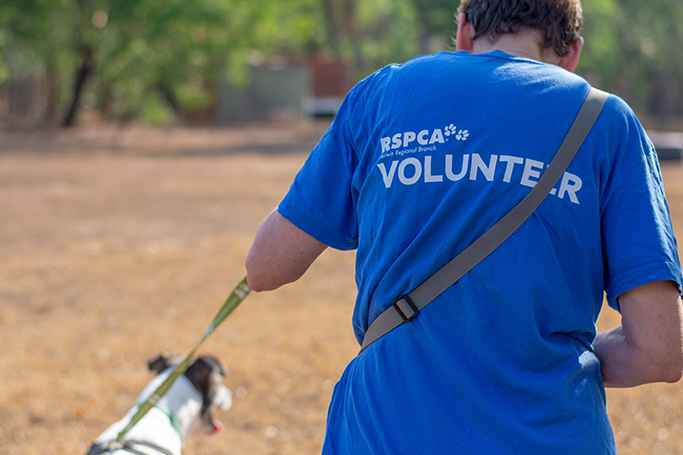 Volunteering with RSPCA Darwin is a unique opportunity to support and give back to your community, build skills, relationships, and experience and be part of a passionate and friendly team. In order to ensure that things run smoothly, we do ask for a commitment from our volunteers of at least 6 hours per month, for a minimum of 3 months. These hours can be spent doing anything from raising funds at local events, spending time with animals, cleaning and helping maintain our shelter, helping in the office or special projects as they arise. If you have special skills and would like to talk about a particular project, we’d also love to hear from you. See the below position descriptions to find out how your skills are most needed at the moment. Please feel free to email volunteer@rspcadarwin.org.au for more information. Are you looking for a meaningful way to engage your team while helping animals? RPSCA Darwin offers corporate volunteering days, where your team can come and assist with projects or general tasks together. Due to health and safety reasons, walking dogs is only a limited component of the day since it requires a lot of training to do without supervision. Instead, you help the animals by improving their shelter. Painting kennels or buildings or facilities. Building enrichment items such as jumps, sniffing items or toys. Giving attention and socialisation to the cats. Helping move or prepare materials. If your team have special skills that they would like to use to help the animals (e.g. building, administration, health and safety etc.) please do let us know. Please email volunteer@rspcadarwin.org.au to chat about opportunities for your team. volunteer@rspcadarwin.org.au to find out about how you can help prior to turning 18.
experience. If you are doing a Certificate and are able to commit to a regular volunteering shift over a number of months, we may be able to assist in some cases – be sure to note this request when applying to volunteer. Please email volunteer@rspcadarwin.org.au if you have any questions.